Dr. John Hayes’ Franchise Fraud School & Pay-for-Praise Emporium has a star pupil and Valedictorian in Catherine Monson, CEO of FASTSIGNS. Her ability to circumvent Amazon Terms of Service by artificially manipulating Amazon sales and customer reviews has put her at the top of the class! 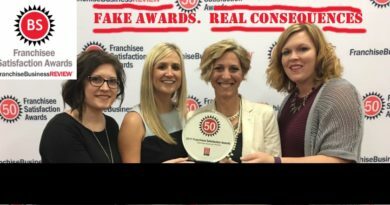 If there were a star pupil, straight-A student and Valedictorian of Dr. John Hayes’ Franchise Fraud School, Class of 2015, it would surely be FASTSIGNS CEO Catherine Monson. In order to preserve the integrity of Community content, content and activities consisting of advertising, promotion, or solicitation (whether direct or indirect) is not allowed, including… Creating, modifying, or posting content regarding your (or your relative’s, close friend’s, business associate’s, or employer’s) products or services. Amazon policy allows friends, family, and even paid reviewers to post if the relationship is clearly disclosed… which Hayes’ reviewers generally do not do. Literally within an hour of FASTSIGNS’ marketing team learning that Amazon had posted the FASTSIGNS Business Opportunity ebook, the team went to work to solicit reviews of the book. They asked members of their Home Office Team, members of their Franchise Sales Team, and members of their Franchise Network to go to Amazon.com, purchase the ebook (purposely priced at 99 cents to attract reviewers), and review it . . .
once the ebook began selling, and readers posted reviews, the title moved into the #1 position on the Amazon Best Seller list for the Small Business Franchise category. As of this writing, the title has kept that position for 3 days – that’s extraordinary because the list is updated hourly! HOW DOES AMAZON’S DATABASE HELP? A #1 Best Seller with more than just a few reviews will soon be identified by the Amazon algorithm and then Amazon will begin to help promote the book . . .
With Amazon’s help, FASTSIGNS is going to get more than a fair share of notice! In the near future, Amazon will promote a 3-day free giveaway for the FASTSIGNS Business Opportunity ebook. . .
that promotion will place hundreds, and perhaps more than a thousand, copies of the ebook into the smart devices of people who are considering the purchase of a franchise opportunity. The book served as a catalyst for people to comment not only about the content of the book, but also about the benefits of owning a FASTSIGNS franchise. It was a very effective way to gain credibility for the brand, and those comments remain on Amazon.com forever! We also enjoyed working with BizComPress as they helped our team coordinate an effective publicity campaign centered around the book. Notice that the Mr. Appliance book has received 9 customer reviews – all verified. A book must get at least 5 reviews (no lower than 4 stars) before it’s eligible for a free eBook giveaway. Verified means that the reviewer purchased the book on Amazon. Hayes also held up Dental Fix RX as a best practices example of cheating the Amazon system with bogus and prohibited reviews. UnhappyFranchisee.Com has Dr. John Hayes’ glowing reviews analyzed for authenticity by FakeSpot & ReviewMeta. Guess what they determined…? ARE YOU FAMILIAR WITH DR. JOHN HAYES & HIS PUBLICATIONS, SCOTT WHITE, BIZCOM PUBLISHING AND/OR ANY OF THE 23 AMAZING FRANCHISES THEY ARE TOUTING? What is so heartbreaking is that Hayes, Scott Scooter “Libby” White, Monica Fiend and Monson are so focused on the scam, they could care less that the real victims are the hard-working moms and dads who invest their lives savings based on the deceptions and lies cultivated in Haye’s Fraud School. Their so-called book is specifically designed to cull the herd and target the least sophisticated potential franchise investor. A knowledgeable investor would see right through this scam simply by reading the hyperbolic garbage in the book. Monson’s involvement is deplorable, unethical and probably illegal. It’s sad. I know a Fast Signs franchisee and he’s a good, hard-working person who does what’s right for his customers. His leader … not so much. Hayes, White and Fiend need to be purged from franchising and public relations. Fake endorsements. Fake rankings. Fake credibility. Cheating Amazon. Lying to investors. All to land that next franchise lead…way to run a company Monson. And way to prey off the unassuming Hayes, White and Fiend. Shameful. You’re grown-ups. Act like it.